Print, scan, fax, email, and copy with the versatile Xerox WorkCentre 7830 colour multifunction printer. This all-in-one device has a monthly duty cycle of 90,000 pages making it an excellent choice for mid-size offices. The Xerox WorkCentre 7830 colour laser printer comes with standard networking connectivity and offers a maximum memory of 3GB. The walkup fax is optional. The impressive Xerox WorkCentre 7830 colour MFP boasts a colour LCD display on its control panel. This model comes with an automatic document feeder that can handle 110 sheets at a time. The Xerox WorkCentre 7830 MFP has a maximum resolution of 1,200 x 2,400 dpi and has print features such as colour by words, job monitoring, secure print, scaling, and more. Print speed can go as fast as 30 ppm with the first colour page out in 9 seconds or 7.7 seconds for monochrome. Users will have no trouble operating the Xerox WorkCentre 7830 tabloid-size colour printer, thanks to its easy-to-use touchscreen that has workflow-optimising capabilities. This unit can help save time and resources with its automatic document feeder and automatic duplexer. The WorkCentre 7830 laser printer also has a USB host, which allows direct printing from and scanning to thumb drives. This model is very easy to setup and is very reliable. It offers Ethernet connectivity for easy sharing among workgroups. Original Xerox WorkCentre 7830 toners can be picked up quite cheaply from an online supplier and some sellers do multi-buy packs for even better value for money. More users could access the Xerox 7830 multifunction printer if it had standard wireless LAN. It would also be more convenient if mobile printing was built-in. 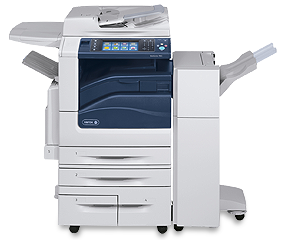 The Xerox 7830 WorkCentre has a high price and optional parts such as finishers and the walkup fax machine are additional costs.